For Disney's upcoming March 4, 2016 release Zootopia, the only cast previously revealed were the two protagonists, Jason Bateman as fox Nick Wilde and Ginnifer Goodwin as rabbit Judy Hopps, plus Shakira as pop star gazelle Gazelle and Alan Tudyk in a previously unspecified role. Previously, in that now the cast for the movie has finally been revealed. Update (11/14): Canadian newscaster Peter Mansbridge will have a vocal cameo as a moose obviously based on him. Among the voice actors revealed are perennial favorite prediction for "next James Bond" Idris Elba as cape buffalo Chief Bogo, recent Best Supporting Oscar winner J.K. Simmons as lion Mayor Lionheart (who also has important roles in other upcoming furry movies Kung Fu Panda 3 and Rock Dog) and less recent Best Supporting Actress Oscar winner Octavia Spencer as otter Mrs. Otterton. 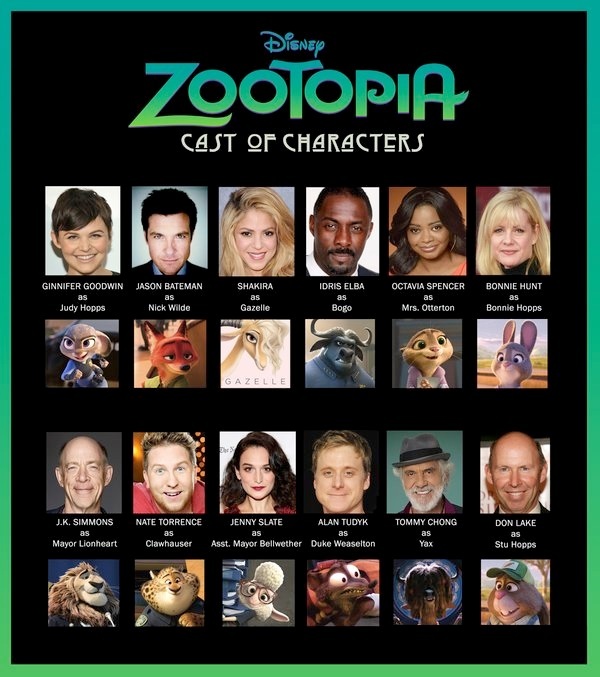 The full list reveals screenshots of a variety of animal characters (Nate Torrence's character is a chubby cheetah) and gives an overview of their roles in the movie. Note that as Zootopia's plot is at least partially about solving a mystery, no character has been revealed as villainous, with the possible exception of Alan Tudyk's character, Duke Weaselton. The name Duke Weaselton just kills me...I wonder if they're just going for the same exact character traits too. And Otterton makes me cry. "And I don't wanna call racist but that sole Black actor playing the Ox with a subtle sudo African name seems a bit...yeah..."
You are reading way too much into it. Most people (if any) would not make that connection. The very idea that you thought of that connection makes *you* the one who is making this about race. So basically, you dislike everything? You should wait to see the film before you judge. Just going from the screen shots, am I the only one that thinks Mrs. Otterton has been rendered to look like her voice actor? Octavia Spencer has this really interesting, expressive face, too. I'd have to agree with that! Hmm, apparently the original link to the full cast listing went down on the Disney blog; I put in an alternative link in the story, but really no new information, so not counting that as a full Update in the story. Ooh, with really nice character bios, too! I was collecting links to concept art for Fred over on another Zootopia article; I'll continue to do so over here, but luckily someone else on Reddit put up this compilation. Here's another t-shirt from Byron Howard; this time for Zootopia's story department. Another T-shirt (I guess I just thought this was going to be a concept art compilation). Hey, actual concept art this time: more from the apparent Bond-parody days, this looks more like just a sketch for fun, one featuring apparently much bigger squirrels than last time, a tiger from the "mysterious island" days, it looks like. Oh, and in case you've missed it, the "Zelfies". Why did they have to cut the vixen? Holy crap, guys, we don't have a Zootopia article on the front page! So, uh, continuing on with the concept art links; so, anyway, actually starting with newly (and possibly accidentally) unveiled Chinese posters followed by a pair of spy themed pieces (probably has something to do with recent movie releases; Jem and the Holograms, obviously). Also, note, the rabbit character was originally male; I don't know who eventually decided to make Judy, you know, Judy, but I'm glad they did. Byron Howard's doing crossover fanart again: Who Framed Roger Rabbit.